The holidays are here! 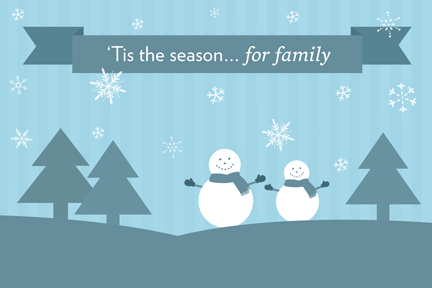 This time of year we focus so much on spending time with our families, and loved ones! This year, our little family will spend Christmas morning at home, and then head out to New York the next day to visit our extended family. There will be gifts, and music, food and games. But, most importantly, there will be the love that we share, and the wonderful feeling of being together as a family.Sadly, there are many kids who won’t experience that family togetherness and love this Christmas.There are currently 402,000 children in the foster care system in the United States and nearly 102,000 children waiting for adoption. Those numbers are staggering! As an adoptee, myself, this cause touches my heart. I only spent 6 weeks in foster care, as an infant. The experience is very different for so many. It is not rare for children to spend years in foster care, moving from one foster home to the next. Many of these children have siblings who are also waiting. In fact, 23% of children and youth actively photolisted on the AdoptUSKids website and waiting for placement in adoptive homes were registered with one or more siblings. These sibling relationships are so, very important, especially for kids who are moving around in the foster care system. Their siblings are the only family they have, and the best gift is for them to be adopted together. While you are celebrating this season with your loved ones, opening presents, please think of the hundreds of thousands of beautiful children who only want one thing for Christmas. A family. You can help make these Christmas wishes come true through adoption. You can also help by sharing these PSAs with your friends and family https://www.youtube.com/user/adoptuskids! If you would like to learn more about adoption, or about becoming an adoptive parent to a child from foster care, please visit www.AdoptUSKids.org or visit the campaign’s communities on Facebook and Twitter. This entry was posted in Adoption and tagged adoption, adoptUSKids, adot, family, foster care.